As the days get warmer, it’s more important than ever to stay hydrated! Fruit infused water is our favorite way to beat the heat. Stahlbush frozen berries are the perfect addition to H20. First of all, the berries can replace ice cubes. While ice cubes only keep your water cool, frozen berries will subtly infuse the water with a distinct flavor and sweet smell. Furthermore, infused water makes drinking the recommended amount easy this summer. Finally, fruit infused water is simple to prepare, tastes great and provides a healthy snack at the end! What’s not to love? Blueberry Lime Fruit Infused Water: We served this combination recently at a company potluck. We never thought something so simple could be so popular! Toss 1 cup of Stahlbush frozen blueberries and 1/2 lime, cut into slices, in a half-gallon container. Cover with water. Refrigerate for four hours or up to 8 hours. 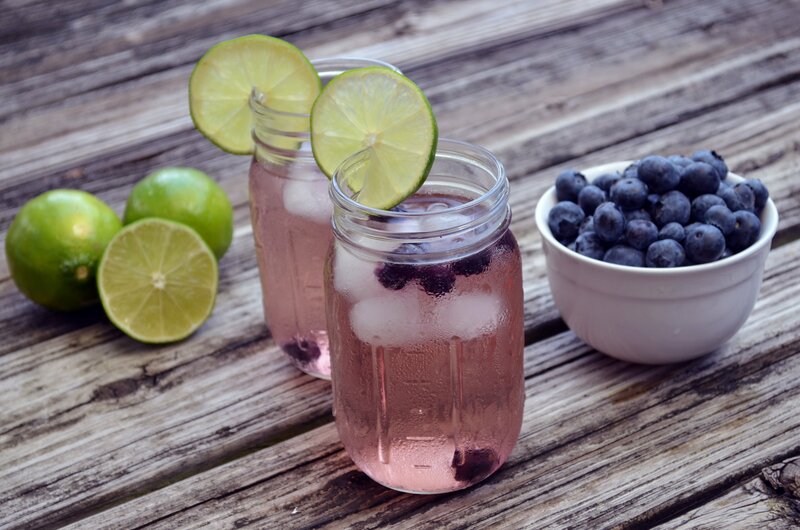 For a single serving, toss a few blueberries and a half of a lime wedge in your water. Blueberry Orange Fruit Infused Water: Toss 1 cup of blueberries and 1/2 of an orange, cut into slices, into a half-gallon container. Cover with water.Refrigerate for four hours or up to 8 hours. To make a single serving, toss a few blueberries and a piece of orange into your glass. Try to wait 5 minutes before devouring it! Minty Blueberry Lemon Infused Water: Toss 1/2 cup blueberries, 2-3 mint leaves and 1 lemon slice into a 1/2 gallon container. Cover with water. Refrigerate for up to 8 hours. Strawberry Fruit Infused Water: This one is simple for a reason! Toss 2-3 strawberries in your glass and wait until they start to sink before enjoying. For a half-gallon container, use 1 to 1-1/2 cups and cover with water. Refrigerate for up to 8 hours. Minty Strawberry Fruit Infused Water: Mint pairs nicely with strawberry and makes your breath smell fresh too! Combine 1 cup of strawberries and 3-4 mint leaves in a half-gallon container. Cover with water. Refrigerate for up to 8 hours. Alternatively, you can make a single serving by tossing a few strawberries in a glass with 1 mint leaf. Again, try to wait until the strawberries start to sink. Cucumber and Mixed Berry Fruit Infused Water: This is a refreshing twist to traditional cucumber water. Toss 1/2 of a cucumber, sliced, into a half-gallon container. Top with 1 cup of berries and cover with water. Refrigerate for up to 8 hours. These are just a few of our favorite, but the sky’s the limit!